If you have an Ultra- Staff EDGE account, you can use Call-Em-All's 2-way text conversations and text broadcasting services there. 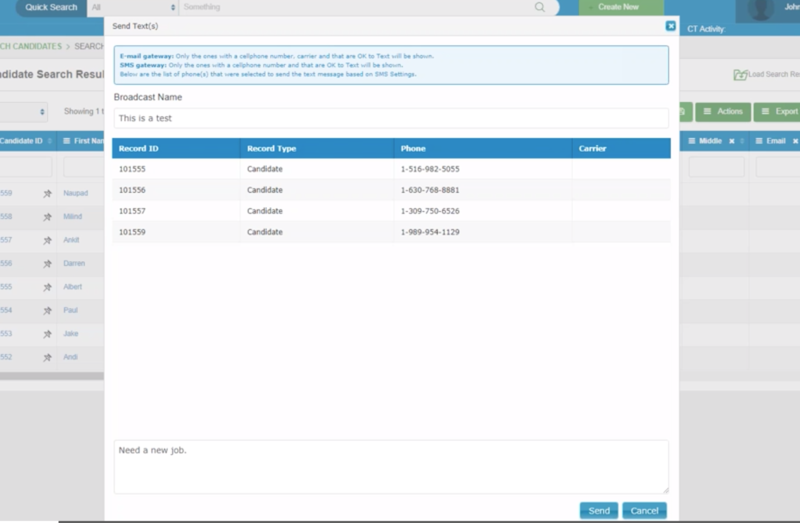 In Ultra-Staff EDGE, you can launch text broadcasts, review results, as well as engage in Text Conversations in the Candidate's profile. To connect your Call-Em-All and Ultra- Staff EDGE accounts, log into Ultra-Staff EDGE and navigate to the Utilities button under Tools. 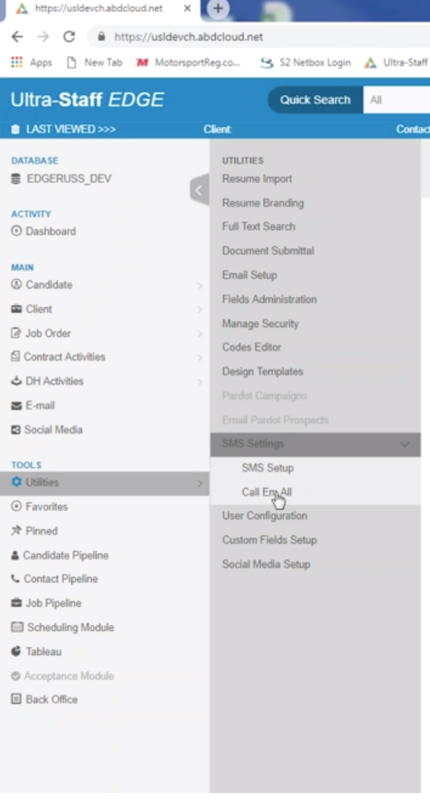 From there, find SMS Settings, click on it, and then select SMS Setup. 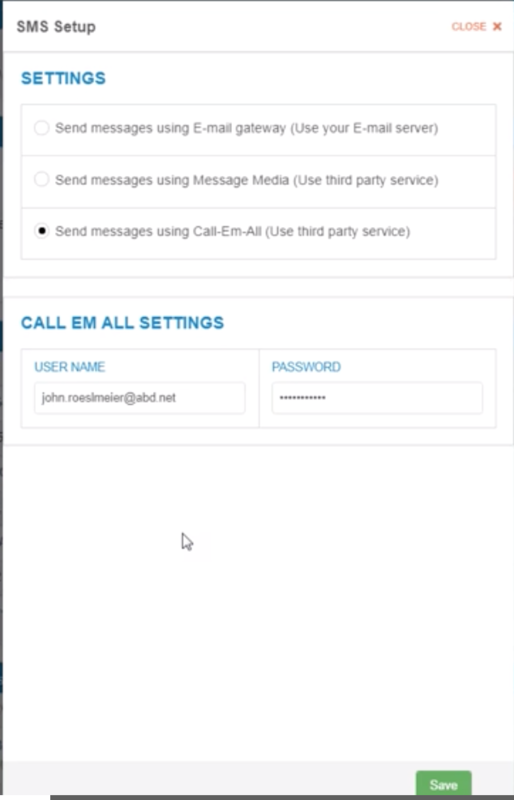 At this screen, simply select the Call-Em-All option and type in your Call-Em-All username and password. That's it! Text Conversations are two-way text conversations between you and a contact in Ultra- Staff EDGE. To initiate a Conversation, simply search for the contact in Ultra- Staff EDGE and go to their Candidate Profile. From there, find their mobile number. Next to that number is a text icon. Click the icon to display your Text Conversation with that individual. A Text Broadcast is what you do when you want to send one text to more than one person people at the same time. Note: any text broadcasts you send out, all the outbound messages will be logged in each contact's profile, so you won't have to manually log who received which messages. 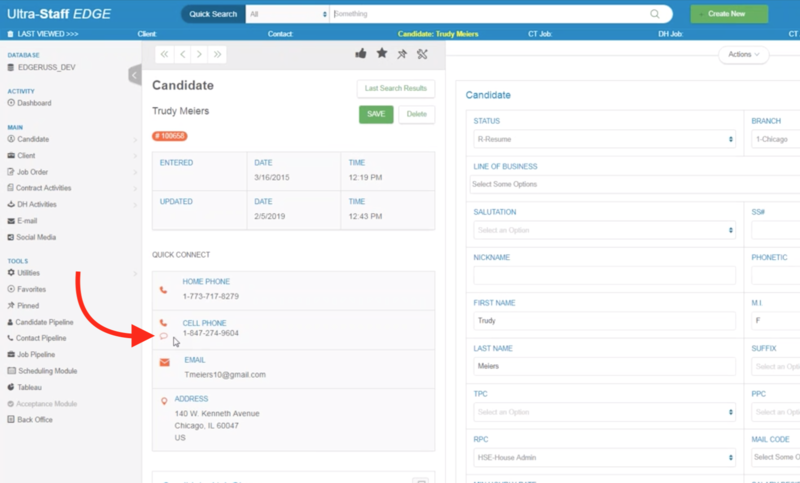 First, go to Candidate Search and run a search for the candidates you want to contact. Once the candidates are pulled up, put a check next to every candidate you want to send a message to. Then, in the Actions drop down, select "Send Text". Lastly, give your Broadcast a name under Broadcast Name and type out the body of your text message at the bottom. When you're ready, press send. For those who are managing their team's Call-Em-All account, meaning you are the master owner of the account, you can access a full view of all Text Conversations. This is helpful if you want to make sure there are no contacts who are awaiting a response from a team member, or maybe you just want to see who all is talking to who on your team. To do this, navigate to the Utilities button under Tools. From there, find SMS Settings, click on it, and then select Call-Em-All. Your Call-Em-All Conversations view will open, allowing you to see every textable number your team has, and all the Conversations that are going on between your number and the selected contact.